The CASSIS (Centre d'Analyse Scientifique de Spectres Instrumentaux et Synthétiques) software has been developed by CESR/IRAP since 2005. 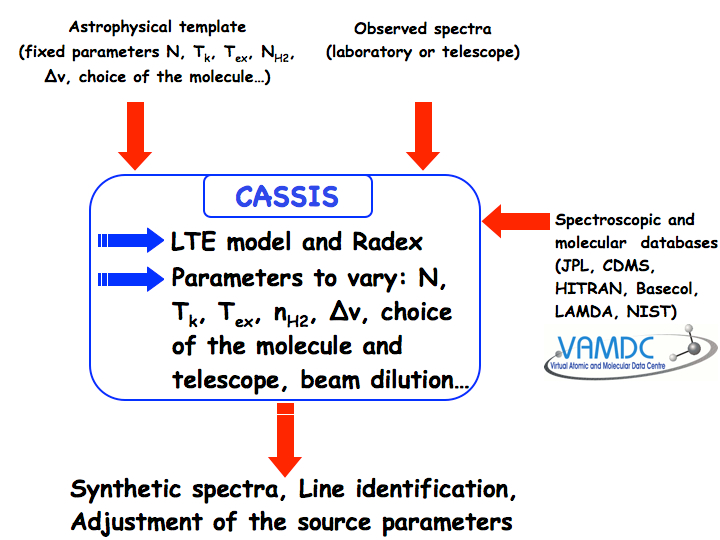 CASSIS uses the SSAP protocol (Single Spectral Access Protocol) to access the IVOA services in order to retrieve any spectra (Hubble, Corot, Splatalogue, ISO, etc; the complete list dans be found at http://registry.euro-vo.org webpage) via our SSAP module. Also CASSIS uses the SAMP messaging protocol (Simple Application Messaging Protocol) that enables astronomy software tools to interoperate and communicate. CASSIS is able to retrieve some useful informations for the modeling or identification from databases (CDMS, JPL, BASECOL) through the VAMDC (Virtual Atomic and Molecular Data Centre) TAP protocol (Table Access Protocol) bases on IVOA format. TAP provides virtual data and allows to plug in the query language VSS2 and the data model VAMDC-XSAMS (the latter being an output format). The Virtual Atomic and Molecular Data Centre (VAMDC: http://www.vamdc.eu/, PI: M.-L. Dubernet, marie-lise.dubernet@obspm.fr) is an EU-FP7 e-infrastructure project devoted to building a common electronic infrastructure for the exchange and distribution of atomic and molecular data. One of the databases integrated into the VAMDC framework is the Cologne Database for Molecular Spectroscopy (CDMS) and it is continuously updated. The maintainer of the latter database is Christian Endres (endres@ph1.uni-koeln.de). This is done on the one hand consulting (via SQLite) a local spectroscopic database (presently CDMS + JPL + NIST + some molecules for which an ortho-para and A-E separation has been made, and that can be regularly updated) and on the other hand with the use of plugged-in models, see below. This is done also using the local spectroscopic database and the information of plugged-in models. Presently a LTE model as well as the RADEX code are available. These models need some information about the source which is provided as templates that can be exported or imported into the CASSIS database. The telescopes information are provided as ASCII files (will soon be xml files) so that any telescope can be very easily added or modified. Presently the models are those listed in 2), but the development plan of CASSIS foresees the plug-in of other models. The models predictions can be computed at any spectral resolution fixed by the user and compared to observational data. Computation of the predicted spectra at the sample resolution of the observations allows a subtraction of the models, channel by channel. Currently CASSIS harbours a rotational diagram tool. From 3), the integrated lines can be fitted and stored into a file which is called by the rotational diagram tool; the latter then yields the estimated column density and excitation temperature of the studied species (both with error bars). A set of results can be obtained varying the source size, but no automated best-fitting tool is available yet.